Kindness, warmth, quiet calm – it is Haydn all over. The sound is spirited, green, and full of silence. Yes, spirited and full of quiet calm, definitely, that much I understand, but green? Just how green is Haydn’s music? 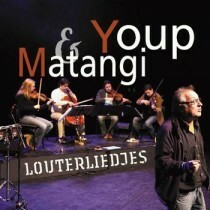 Frog, bird, sunrise… Although Matangi zealously devotes itself to the composer’s sustainability, do not allow yourself to be hoodwinked by the names given to the string quartets in this compilation. 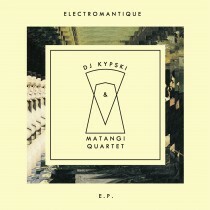 The Matangi Quartet and DJ Kypski are both very well-known in their own field of music. But both want to broaden their horizon and that is were the meet! 'Electromantique' explores the world of classical music together with for instance dance. The music of Electromantique seamlessly goes from hip hop to minimal music, from electro to baroque, from dubstep to experimental. They perform and play live together. This is not a string quartet playing along with a dj or a dj who puts a few beats under some strings! This is a real band, of 5 musicians, a quintet! Although their musical worlds are miles apart they have one common passion: the exploration and the breaking through musical barriers and the development of new and adventurous music and sounds! A luxurious Anniversary-candybox with different musical sweets. The music fits the quartet like a glove and with it the quartet celebrates that already for 10 years it is an important, fully professional and full time stringquartet. The box has divers, challenging and delightful music. Just like a heavenly tasting candybox should be: delicious! This music shows exactly how multifaced the Matangi Quartet is. The gritty humour, momentum and irony in this arrangementby Sándor Devich (second violinist of the renowned Bartók Quartet) give the impression that Shostakovich was somewhere nearby, but when Bartók wrote these notes, in May 1908, Dmitri Dmitrievich was not yet 2 years old! For five movements, Jenkins lets us grabble freely in a candy box of the most divergent types of music, fluttering from folk-like fiddle to baroque beat, minimal and tango. In the Dutch new music world, Chiel Meijering is the craftsman who composes at lightning speed and time and again opens the door to the liberating beats of pop culture. Meijering drags anything from there that is quick, supple, exciting and hot into Caixa de Dolços, the Matangis acoustical playground. The Eastern European composer Vladimir Godár, from Bratislava, is renowned as a film composer and often named in a single breath with his spiritual predecessors Arvo Pärt and Henryk Gorecki. But he has more skills than just swinging the censer. In Godár’s Concerto Grosso for 12 strings and harpsichord, there’s a daredevil presto, for instance. 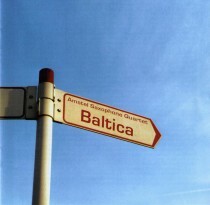 Foot-stamping neo-Baroque. In Música de Feria, Silvestre Revueltas brings total abandon and surprising twists. Dictatorship, revolution, civil war and revolutionary leaders, several of whom died prematurely, murdered: Revueltas experienced it all, as can be heard in the impetuous outer movements. What comes between is like an acid full of soft and pure fruit extract, for at the fair (feria), the heart of the Mexican nation beats with warm-blooded folklore. Suk looks for consolation in an old Bohemian chorale, Svatý Václave. A sultry atmosphere rises from the Serenata by Joaquín Turina Pérez, who was born in Seville and was a friend of De Falla. We come upon the pianist, composer and music journalist shortly after his pen was temporarily silenced by the Spanish Civil War. The Dutch soprano Miranda van Kralingen studied with Ank Reinders at the Sweelinck Conservatorium in Amsterdam and graduated with distinction. But it was after Elisabeth Schwartzkopf's masterclass at the Concertgebouw that her career really took off: she sang Strauss's Vier letzte Lieder during the closing concert in the category "Young Dutch Talent", which was broadcast on radio and television. This lead to a host of opera and concert engagements with De Nederlandse Opera, Opera Zuid. the Nationale Reisopera. She is known as the "singing actress" both at home and abroad, where her opera career has also taken off. Her début as Contessa in Mozart's Le Nozze di Figaro was soon followed by roles in der Rosenkavalier, Don Giovanni, Die Lustige Witwe and Die Fledermaus. Impressed by her talent as an actress, the renowned director Harry Kupfer invited her to perform in Berlin at the Komische Oper's fiftieth anniversary. She made her impressive French debut in the Théâtre Champs-Élysées in Paris with Agathe (Der Freischütz). Her first performance of Tosca with the Welsh National Opera met with popular acclaim. She also sang with the Stuttgart Opera. Miranda van Kralingen is much in demand as a concert singer in and outside Europe. Her wide repertoire ranges from Monteverdi to Messiaen. She regularly gives master classes including the piano/voice duo classes at the Orlando Festival jointly with Tan Crone. She is also active on the chamber music scene and in the theatre, is much in demand at international chamber music festivals. In 2004/2005 she staged the theatrical concert Zangkoorts with pianist Gregor Bak, received from José Carreras in person the "José Carreras Diamond Tulip Award" in recognition of her national and international vocal achievements over the past years. Miranda van Kralingen sang Schubert's Ave Maria at the Wedding of Prince Willem-Alexander and Princess Máxima on 02.02.02. 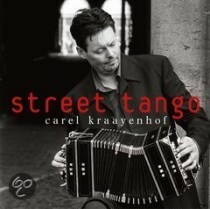 She has been artistic director of Opera Zuid since June 2004. 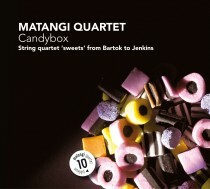 The Matangi Quartet. Matangi is a four-armed Indian Goddess of the spoken word and symbolises universal knowledge, including all forms of art, music and dance. As an artist, she forges her own way in society. Shortly after its formation in 1999 the young Dutch Matangi Quartet's whirlwind career took off and it is now hard to imagine the Dutch music scene without them. 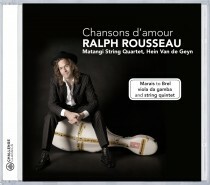 The four members invest all their time and energy into the string quartet. Their first CD was entitled Première (CC72164), and was followed in 2003 by the provocative single CD Bats from Hell, a piece composed for them by Chiel Meijering. 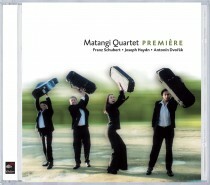 In 2002 the Matangi Quartet was the recipient of two prizes: the Almere Chamber Music Prize and the Kersjes van de Groenekan Prize. The Quartet feels at home in all sorts of repertoire from early Haydn to contemporary composers. 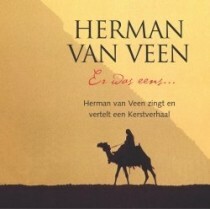 Their scope of interest has even taken them beyond the world of classical music and into, for example, a collaborative project with the Dutch cabaret artist Herman van Veen. 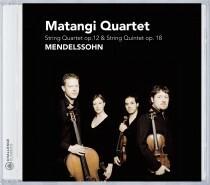 The Matangi Quartet has completed an intensive two year course at the Dutch String Quartet Academy (NSKA) and since 2003 has been coached by viola player Henk Guittart of the Schoenberg Quartet. The Dutch National Musical Instrument Fund has expressed their faith in the Matangi Quartet by lending them three instruments. In 2005 Matangi recorded Skandinavia (CC72137) for Challenge Classics. 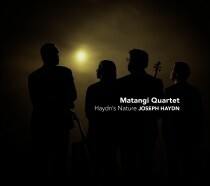 The Matangi Quartet was founded in 1999 and is familiar to a very wide range of repertoire, from young Haydn up to contemporary composers, even performances with current popular singer-songwriters like Hermann van Veen are possibile.